Hard to find extended cabin version of the renowned Noosa Cat 3500, commissioned new in 2003 by the current owner who is meticulous in his care and maintenance of this beautiful craft. Known for their robust construction and sea-kindly nature, these boats have been put to the test by Coast Guard, rescue organisations and other demanding entities. "Kunara II" is powered by twin 260 hp Volvo diesels with duo-props, giving a cruise speed in excess of 23 knots. Hours are low at approx 650. Accommodation is generous with two private double cabins, extended saloon with convertable dinette and galley, opening to the huge cockpit with it's transom and side access doors which give the boat excellent accessibility from most jetty heights. The inventory wants for nothing and includes electronic engine controls and monitoring, auto-pilot, radar, plotter, sounder, solar charging, charger/inverter, plenty of battery capacity, plus shore power. The galley has a two burner gas stove, microwave, pressurised hot water, electric fridge plus refrigerated ice chest under the settee. There is also a stainless BBQ and the vessel is gas compliant. Bathroom has electric flush toilet and holding tank. All upholstery was renewed in 2017. For the most part this vessel lives on it's quality tri-axle trailer which is not included in the sale but can be purchased at a fair market price. A full set of service records have been retained by the owner. 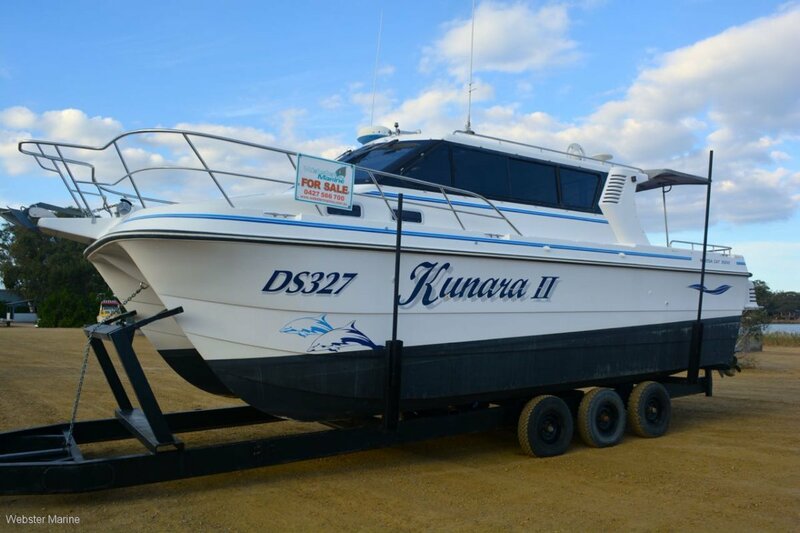 "Kunara II" is a pleasure to offer to the market and will reward inspection. Interstate delivery can be subsidised by negotiation. Regularly serviced and comprehensive maintenance regime.